It’s been a long time since you last heard from me. Several things have happened in my life. Well, first, I had to get a job. My consulting business was doing well, and I was actually pretty good at it (at least, I thought so). But circumstances unforeseen changed what I had to do next; and lo, I had to get a job, you know, a real job. So now I’m working for EY (Ernst & Young before 2013) doing talent analytics. There are more books I want to write. But if I tell you I’m thinking of writing another book at any point over the next year, please someone punch me right in the face. You should expect me to start posting more regularly here soon. 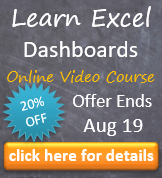 Thank you all for your support of me and this blog, your patience, and your passion for Excel. This entry was posted in Tips on June 28, 2015 by Jordan G.
Congratulations on your new job and your hard work. Massive Congratulations Jordan. Looking forward to the book. Even more so, I am looking forward to you getting back to blogging.